Galerie André François Petit, Paris (by 1968). Viktor and Marianne Langen, Meerbusch (1983). R. Descharnes, Dalí: L'oeuvre et l'homme, Lausanne, 1984, pp. 148 and 447 (illustrated in color, p. 148). V. and M. Langen, Kunst des 20ten Jahrhunderts: Sammlung Viktor u. Marianne Langen, Ascona, 1986, vol. II, p. 283 (illustrated in color, p. 284). R. Descharnes and G. Néret, Salvador Dalí: The Paintings, 1904-1946, Cologne, 1994, vol. I, p. 197, no. 442 (illustrated in color). M. LaFountain, Dalí and Postmodernism: This is Not an Essence, Albany, 1997, pp. 53-54. P. Polsani, "The Image in a Fatal Kiss: Dalí, Lacan, and the Paranoiac Representation" in M.D. Morales and A.J. Poust, eds., Lorca, Buñuel, Dalí: Art and Theory, Lewisburg, Pennsylvania, 2001, pp. 159-160. New York, Julien Levy Gallery, 1936, no. 1. Paris, Galerie André François Petit, Obsessions et visions, May-June 1968, no. 18 (illustrated; titled La tartane fantôme). Paris, Galerie André François Petit, Salvador Dalí: Oeuvres anciennes, 1970, no. 31 (illustrated). Humblebaek, Louisiana Museum, Salvador Dalí, October-December 1973, no. 15. Stockholm, Moderna Museet, Salvador Dalí, December 1973-February 1974, no. 11. Frankfurt-am-Main, Städtische Galerie und Städelsches Kunstinstitut, Salvador Dalí, March-May 1974, p. 15, no. 9 (illustrated in color, p. 23). Paris, Musée national d'art moderne, Centre Georges Pompidou, Salvador Dalí: Rétrospective, 1920-1980, December 1979-April 1980, p. 251, no. 183 (illustrated in color). London, Tate Gallery, Salvador Dalí, May-June 1980, p. 26, no. 97 (illustrated in color). Basel, Galerie Beyeler, Surrealismus: Traum des Jahrhunderts, October 1995-March 1996, no. 22 (illustrated). Düsseldorf, K20 Kunstsammlung Nordrhein-Westfalen, Surrealismus 1919-1944: Dalí, Max Ernst, Magritte, Miró, Picasso..., July-November 2002, p. 215 (illustrated in color). London, Tate Modern; Los Angeles County Museum of Art; St. Petersburg, Florida, Salvador Dalí Museum and New York, The Museum of Modern Art, Dalí & Film, June 2007-September 2008, p. 233 (illustrated in color, p. 47, fig. 24). Kunsthalle Wien, Le Surréalisme, c'est moi!, June-October 2011, p. 313 (illustrated in color, p. 143). Frankfurt am Main, Städel Museum, Die schwarze Romantik: Von Goya bis Max Ernst, September 2012-January 2013. Aix-en-Provence, Musée Granet, Le Grand Atelier du Midi: De Cézanne à Matisse, June-October 2013, p. 235, no. 166 (illustrated in color). In the early 1930s, Dalí began to paint a highly important series of haunted, dream-like landscapes based on the desolate plains, jagged rocky outcrops, and immense sandy beaches of his Catalan homeland. Eerie but poetic in mood, these spare, melancholy landscapes are peopled only by spectral figures and phantom images, which emerge from the vast, still emptiness like a desert mirage. "These compelling paintings extend in the twentieth century the great tradition of European romantic landscape painting founded by Caspar David Friedrich and Turner in the early nineteenth century in which the central theme is man's awed contemplation of his own appalling isolation in it," Simon Wilson has written. "These paintings are characterized by an intense luminosity in which figures and objects appear with all the quality of a hallucination" (exh. cat., op. cit., London, 1980, pp. 16-17). The haunted landscapes, at once exquisitely beautiful and supremely disquieting, date to a critical moment in Dalí's career. In 1929, he had officially joined the Surrealist group, thereby moving into the very center of the European avant-garde. His first solo exhibition opened at the Galerie Camille Goemans in November and brought the twenty-five-year-old artist immediate acclaim, and, indeed, no small measure of notoriety. André Breton, the leader of the Surrealist movement, proclaimed, "It is perhaps, with Dalí, the first time that the mental windows have opened wide" (quoted in D. Ades, Dalí, London, 1982, p. 84). By 1934, the year that he painted Moment de transition, Dalí was at the height of his powers as an artist, writer, and thinker, and his startlingly inventive talent was drawing attention and patronage in Paris, London, and New York. This was not, however, a period without struggles for Dalí. His union with Gala, a divorcée ten years his senior, had caused a terrible rupture with his father, his relationship with Breton was beginning to deteriorate, and Europe had entered a period of ominous political uncertainty, as Hitler started his rise to power and Spain moved ever closer to civil war. In the haunted landscapes, though, it is not contemporary events but Dalí's childhood memories that provide the artist with the framework for probing his innermost anxieties and fantasies. Moment de transition depicts a covered, two-wheeled cart--the traditional Catalan tartana--that appears to be approaching the low-lying, white-washed buildings of a small town. The setting is the vast, flat Ampurdàn plain, which stretches from the foothills of the Pyrenees to the sea; Dalí's hometown of Figueres is situated in the center of this plain, between Barcelona and the French border. Dalí based the painting on his memory of a childhood journey in a horse-drawn carriage to El Molí de la Torre, the farmhouse belonging to his family's close friends Ramon and Germaine Pichot, which the artist remembered slowly approaching at sunset. The present canvas represents Dalí's definitive treatment of the theme of the "phantom cart," which he had first explored the previous year in two much smaller oil paintings on wood (fig. 1). In both of the preliminary panel paintings, the composition is almost achingly spare. The limitless, desert-like plain that the cart traverses is utterly flat and deserted, and the expansive void of the sky is broken only by the faintest traces of cloud. The buildings of the town cluster in front of the low hills at the distant horizon, which divides the composition into two equal halves. The entire scene is suffused in a unified, blond luminosity, the embryonic shadows suggesting the pale, shimmering heat of midday. The desolate foreground is articulated only by the gravelly tracks of the cart wheels or by a fragment of encrusted amphora, an archaeological detail that evokes the ancient history of Catalonia as well as echoing Dalí's interest in mining his own long-buried past in his mature paintings. In Moment de transition, the culminating statement of the sequence, Dalí has amplified the expressive intensity of the scene, replacing the haunting melancholy of the small panel paintings with a sense of eerie and disquieting foreboding. He has dramatically lowered the horizon line, compressing the foreground plain into the bottom-most quarter of the canvas. The cart now seems to draw closer to the town, which no longer reads as a distant, unattainable mirage, and a ghostly female figure in fluttering drapery ominously approaches the cart from the left. The high blue sky is filled with looming, ominous, green-tinged clouds, the shapes of which are echoed in the craggy rock formations that now emerge from the flat, arid plain. The pale, delicate tones of the earlier scenes are replaced here by rich ochres and blues, complementary colors which signal the almost lurid intensity of the late afternoon sun; the cliffs, the cart, and even the smallest pebbles cast long, irregularly shaped shadows across the landscape of Dalí's childhood. Yet the most unsettling aspect of Moment de transition is one that does not necessarily reveal itself at first glance. The painting and its two smaller variants are among Dalí's earliest and most successful uses of the enigmatic device of the double image, which the artist described as "such a representation of an object that is also, without the slightest physical or anatomical change, the representation of an entirely different object" (quoted in R. Descharnes, op. cit., 1984, p. 148). Dalí first attempted the double image in L'homme invisible of 1929 and continued to perfect it until 1938 (fig. 3). In the present painting, the driver and passenger in the cart (which itself resembles a hollowed-out bone) can also be read as the silhouettes of two towers in the distant village toward which they are traveling, while the wheels of the cart double as two stakes planted in the ground. "The minuscule 'doubling' of buildings and figures successfully introduces a disquieting sense of doubt and confusion in the viewer, whose experience in looking at the work is akin to seeing a mirage or hallucination," Michael Taylor has written. "The constantly shifting apparition of the two figures in the wagon and the towers of the town eventually metamorphose into a single entity in which the cart becomes its own destination. This optical illusion, which represents Dalí's first complete success in achieving a double image, is enhanced by the diffuse golden light that bathes the painting in atmospheric effects" (Dalí, exh. cat., Palazzo Grassi, Venice, 2004, p. 200). 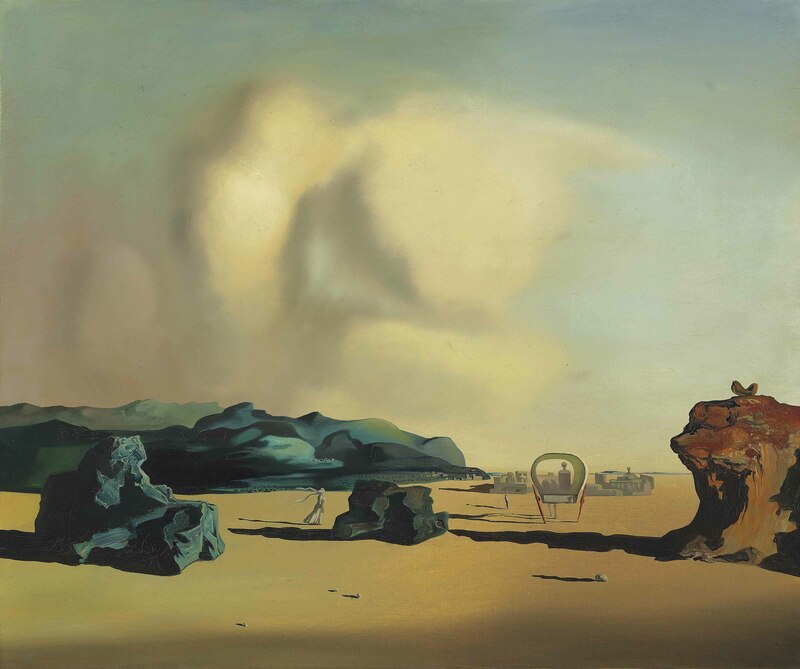 Dalí was intrigued by the visual instability produced by the metamorphosis of the view as one moves slowly through a landscape, which he likened to the constant shifting of clouds (and their petrified likenesses, the great rock formations of Catalonia). "All the images capable of being suggested by the complexity of their innumerable irregularities appear successively and by turn as you change your position," he explained, recalling an outing with a group of Catalan fishermen. "As we moved forward with the characteristic slowness of a row boat, all these images became transfigured. What had been the camel's head now formed the comb of a rooster" (quoted in D. Ades, op. cit., p. 121). In the present painting, the shifting of forms engendered by the double image thus re-creates the perceptual experience of the long, slow trip by cart that Dalí and his family took to the Pichots' farmhouse in his youth. "He may even be linking it," Dawn Ades has suggested, "with another famous exercise in memory, Proust's description in A la recherche du temps perdu of watching, during an evening drive, the two bell-towers of Martinville appearing slowly to change places and then meet the tower of the more distant village of Vieuxvicq, which was accompanied for Proust by the conviction that there was something hidden behind this movement" (Dalí's Optical Illusions, exh. cat., Wadsworth Atheneum, Hartford, 2000, p. 92). The double image in Moment de transition--the title itself evoking the constant passage from one form to another and back again--also visualizes the relativity of time, a theme that Dalí most famously addressed with the drooping watches of La persistence de la mémoire, 1931. The cart that was en route to the faraway town has merged with the point of its arrival; now, with its itinerary expunged, the cart becomes an image of both perpetual motion and insistent inertia, neither traversing space nor passing time. "Time itself is liquid, soft and elusive, mercury on shiny mirror glass," Marc LaFountain has written. "Dalí most eloquently illuminates this flow in the phantom cart paintings of 1933 and 1934" (op. cit., p. 53). Finally, the double image was fundamental to what Dalí termed his paranoiac-critical method, an approach to painting that exploited the ability of the paranoid mind to read meanings under meanings by a train of irrational and highly subjective association. It was by a distinctly paranoiac process of thought, Dalí claimed, that his multiple images were generated. "The paranoiac activity offers us the possibility of the systemization of delirium," Dalí wrote in an unpublished film scenario from the early 1930s. "Paranoiac images are due to the delirium of interpretation. The delirium which, in the dream, is wiped out on waking, really continues into these paranoiac images and it is directly communicable to everybody" (quoted in D. Ades, op. cit., p. 124). Dalí first expounded his theories on paranoia in "L'Ane pourri" ("The Rotten Donkey"), a long poem-manifesto published in 1930 in the newly founded journal Le Surréalisme au service de la revolution. He inscribed his interest in paranoiac double images--the questioning of the veracity of the external world's appearance through multiple figurations and visible illusions--within the context of the Surrealists' persistent denunciation of reality. "I believe the moment is at hand," Dalí proclaimed, "when by a paranoiac and active thought process it will be possible (simultaneously with automatism and other passive states) to systematize confusion and contribute to the total discredit of the real world" (quoted in exh. cat., op. cit., 2000, p. 26). In Moment de transition, the sense of visual instability engendered by the double image is heightened by the eerie and unexpected appearance of the lone female figure to the left of center, who seems to be approaching the cart. Dalí identified her as his cousin Carolinetta Barnadas Férres, who had succumbed to tuberculosis when he was only a teenager; decades later, he still vividly remembered news of her death reaching his family by letter. The frail, consumptive Carolinetta appears on the vast, bleached expanse of sand in several of Dalí's paintings from the beach of Rosas as well, always shrouded in flowing, wisp-like drapery (fig. 3). In the present painting, Carolinetta seems to hover weightlessly just off the ground, frozen mid-step, like a specter or apparition. The long shadow that she casts on the ground, however, points to the corporeality of her figure, troubling the viewer's intuitive reading of the image. Moreover, the long, blowing ends of her headscarf suggest a strong wind sweeping across the plain, whereas the remainder of the scene appears utterly still. It is as if she exists in a different space from everything else in the picture, like a photograph projected onto the landscape (compare fig. 4). "The painting encapsulates the experience of memory, the irrational resurgence of childhood experiences or sensations. The poignancy and futility of human memory are suspended within the immensity of idea of space-time," Ades has concluded. "Surrealism alone has systematically sought the interface between internal and external realities, illusion and vision, perception and thought. Dalí confronted this problem with energy, not just in his construction of an iconography rooted in psychoanalysis but in a closely linked and wide-ranging exploration of the affective relations between perception, vision, and optical effects" (ibid., pp. 12 and 98).